One of the five nominated members of the Gambia National Assembly who was said to have her nomination revoked and subsequently sacked from the legislature by the Gambian President is challenging the constitutionality of her sacking from the law-making body. Hon Ya-Kumba Jaiteh was one of the five people nominated by President Adama Barrow but her nomination was recently revoked by the president and is now challenging her purported sacking at the Supreme Court of the Gambia after filing an injunction. 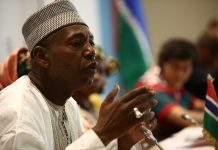 The injunction, filed on Wednesday, is against the Speaker and Clerk of the National Assembly as well as the Attorney General and Minister of Justice and according to the Principal Secretary at the Supreme Court of the Gambia, Amie Drammeh, the filing of the injunction which began on Tuesday has already been completed. Many lawyers believe that the case would be an exciting one as it’s unprecedented in the legal and political history of the country. The Daily News has gathered from sources privy to the case that the injunction was filed to prevent both Hon Kumba’s sacking and allow her continue her legislative roles until such time the court decides on the case. “The intent was to declare the President’s actions unconstitutional and to prevent her successor, Foday Gassama, from posing as a member of the Assembly. It’s also filed to prevent the Speaker and Clerk from swearing in Gassama as a member of the legislature,” sources disclosed. Consequently, Barrow’s proposed replacement will not be sworn-in until the Supreme Court decides on the issue. The Supreme Court sits on Monday, March 11th and Kumba’s case is expected to be one of those to be heard. Meanwhile, Gambia’s constitution is clear on how a lawmaker can be removed from the National Assembly and also explained how someone can be nominated but experts said it is silent on how a nominated lawmaker can be removed. Several lawyers, including the Gambia Bar Association said it is unconstitutional for the president to fire a nominated.